Rich, full-bodied espresso with hot water. In Europe, coffee is essentially espresso – which, in America, isn’t very much coffee. 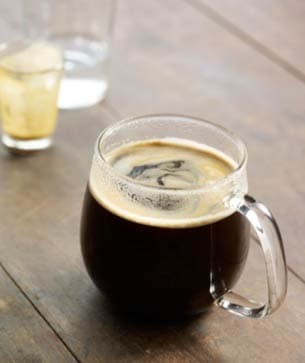 To create a caffè americano – a coffee that satisfies the American preference for more sips in every cup – Europeans simply add hot water to their espresso. While the americano is similar in strength and taste to American-style brewed coffee, there are subtle differences achieved by pulling a fresh shot of espresso for the beverage base. The best way to discover these nuances, of course, is to try a cup yourself.